Traditionally, janitorial work has been done after dark. In recent years, however, an increasing number of facilities are eliminating nighttime cleaning in favor of day cleaning. Advocates of day cleaning cite many benefits to the method, and expect it will continue to gain steam in the coming decade. Building owners and facility managers often choose second or third-shift cleaning to keep janitorial crews from interfering with building occupants’ work or vice versa. The out-of-sight, out-of-mind approach wasn’t possible, however, in buildings like hotels or casinos that are occupied 24-7. 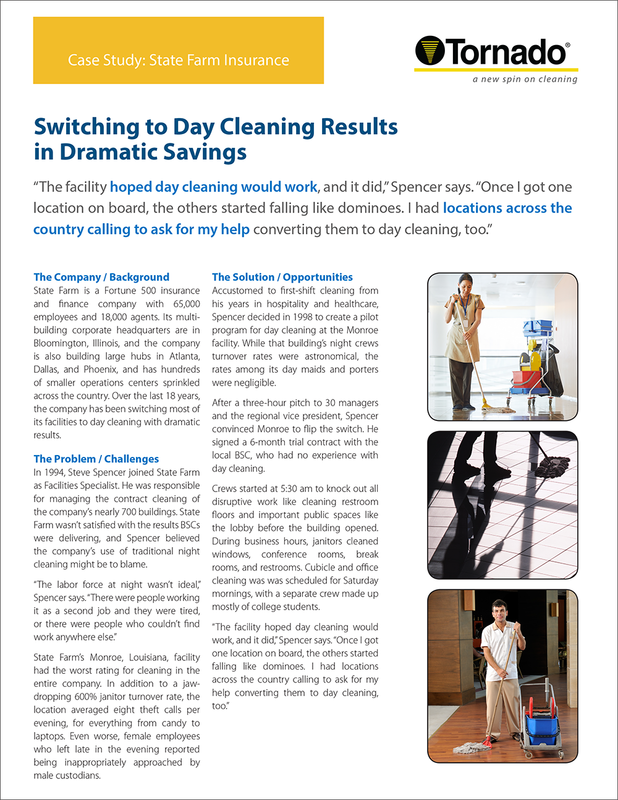 These facilities have long utilized day cleaning, but now many other industries are realizing the benefits. Lower Costs: Energy is the largest single cost for a commercial building. Simply turning off the lights at night and moving cleaning operations to daylight hours can reduce a building’s electric bill by 10 percent or more a year. Most facilities see further savings by eliminating day porters. Better, Happier Workers: Day shifts are more appealing to workers, making it easier to recruit quality applicants for both frontline and management jobs. The hours also create higher job satisfaction with turnover rates often at 10 percent a year or lower compared to the industry average of as much as 70% to 100% (or rates that can even reach much higher). Fewer Complaints: Having janitors present during the workday creates camaraderie and community with building occupants. 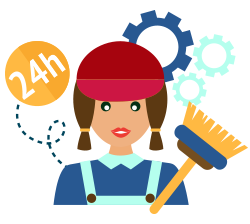 Occupants who know custodians by name are more likely to go directly to cleaning staff with problems rather than complain to management. They’re also more likely to contribute to cleaning efforts and report higher satisfaction levels than when janitorial crews are anonymous. Less Supervision: By working in an occupied environment, cleaning crews’ moves are monitored by building occupants. This means less management oversight is required and workers are less likely to take unscheduled or extended breaks. Even better, theft incidents are typically reduced to almost zero in daytime cleaning operations. 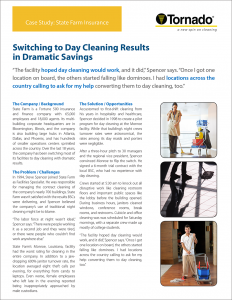 Despite the numerous benefits, day cleaning isn’t the best fit for every facility. In general, it’s most successful in office buildings, schools and universities, and 24/7 facilities. Some important considerations include whether there is sufficient parking to accommodate building occupants and cleaning staff, and whether there are machines or events that would interfere with cleaning efforts. Day cleaning comes at a price. It may require higher wages, switching to full-time staffing, providing uniforms, and retraining staff. To offset the capital investment, housekeeping managers or BSCs will need to educate building managers or owners about the long-term savings (above). After getting approval and buy-in for the switch, it’s a good idea to get a commitment of at least 6 months from management. This will allow time for ironing out the kinks that are inevitable when making such a dramatic switch. Keep management, building occupants, and cleaning crews involved and informed during the implementation process. Open and honest communications about both the opportunities and the challenges is important for success. It’s important to note that day cleaning is not night cleaning done during the day. You can’t simply switch the hours of your same staff and equipment and expect a seamless transition. Carefully think through how cleaning can be accomplished without interfering with business operations. Day cleaning must function like a well-oiled machine, with every task scheduled like clockwork. It’s very likely your hours will be slightly different than the building’s, with some tasks performed before occupants arrive or after they leave. While many cleaning tasks (restrooms, conference rooms, break rooms, entryways, etc.) can be executed during work hours, more disruptive activities (vacuuming cubicles, cleaning restroom floors, stripping and refinishing floors) will likely need to be performed outside office hours. Day cleaning may also require an investment in new equipment that make operations safer and less disruptive. For example, low-decibel vacuums are an important tool for keeping sound levels in check when a building is occupied. Battery-powered machines can eliminate trip hazards to improve safety. 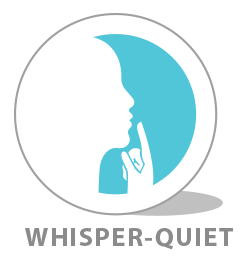 Switching to low-odor, no-VOC chemicals and microfiber mops and wipes can improve indoor air quality (IAQ), which is an important consideration in an occupied space. Flipping the switch from nighttime to daytime cleaning isn’t easy. Done well, however, it can save money, improve employee morale, and boost customer satisfaction. 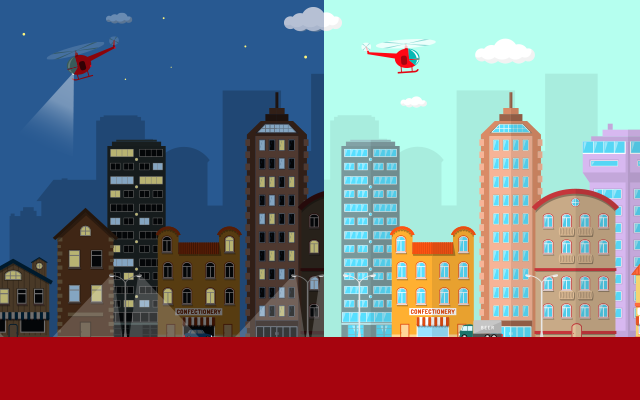 By turning off the lights at night, buildings cut energy costs by 8%, and eliminating day maids and porters and reducing supervision saved 10% on cleaning costs. That translated into $350,000 and $100,000 in savings per year, respectively, at State Farm’s Federick, Maryland State Farm location.